I’d been working out at home for some time and had created what I thought was a pretty impressive basement gym. I had my squat rack, my bench and my dumbbells. But when I invited my former gym training partner to check out my workout dungeon, the first thing he asked was, “Where’s the pull up bar?” When I told him I didn’t have one, he scoffed at me, insisting that, unless I got a solid bar to hang from, I was going to be spinning my wheels with my dinky little home gym. That made me mad. But it also got me searching for a quality pull up bar. After all, I knew he was right. Pull ups are the bread and butter of a decent upper body workout. My Pull Up bar search led me to a company called ProSource. I decided to bite the bullet with their doorway pull up bar. Read on to find out whether ProSource could be the solution to your home pull up bar requirements with put ProSource Pull Up Bar review. Solid Construction - There are a lot of cheap, poorly constructed doorway pull up bars on the market. You need to wade through these junk offerings to find the bar that will consistently provide the strength and rigidity to support your bodyweight while you’re repping out. Maximum Weight Allowance- You need a bar that is rated to not only take your body weight but to be able to handle any additional poundage that you care to strap onto your body when you’re strong enough to do so. A doorway bar will never be as strong as a mounted one, but you should expect a 300 pound capacity. Grip Variation - In addition to the straight bar grip to allow for close, medium and wide options, look for a bar with angled ends to allow for a more ergonomically perfect rep. You’ll also want a bar with parallel handles that allow you to do neutral grip hammer pull ups. Mounting Plate Thickness - If your bar mounts to the top rear door framing, you need to check the required thickness of the frame. If the bar requires much more than an inch you are going to be limited as to your doorway options. Required Doorway Width - You’ll want a bar that will work on doorway widths of between 24 and 32 inches. Hand Grips - Hand slip is a common pull up problem. To ensure that your hands don’t give out before your lats do, the bar should have quality rubber grips at every gripping position. The ProSource Doorway Pull Up Bar offers everything you’d expect in a quality pull up bar, with the addition that it provides wide grip options that many of it’s competitors fail to deliver. The unit comes with clear set-up instructions allowing the unit to be put together in under ten minutes. The metal is heavy gauge, giving a very solid feel to all of the bar that make up the unit. The main pulling bar is a single piece, enhancing the strength of the unit. Fully assembled the bar weighs about one kilo (2.2 pounds). The ProSource ﻿﻿Pull ﻿﻿Up Bar comes with a couple of brackets that are designed to be screwed to the wall above the rear door frame to hold the unit in place. These plates will not, however, sit flush with all door wall thicknesses. If you can’t mount these plates, the bar will work perfectly fine without them. One of the most impressive features of the ProSource Doorway Pull Up Bar is the range of grip options on offer. In addition to the standard straight bar options, this unit provides looped handles to allow for a variety of neutral grip moves, as well as extended bar that come out from the loop handles to allow for extra wide grip pull ups. Each of those gripping positions has in place a rubber hand grip to help to maintain your grip. The ProSource bar will work on any doorway that is between 24 and 32 inches thick. It requires a one inch thick lip on the top of the door frame for mounting. The maximum load capacity of the bar is 300 pounds. Multi grip options - the ProSource Doorway Pull Up Bar is an impressive looking piece of equipment because of the range of grips that it provides. The parallel looped handles allow for the all important neutral and hammer grip pull up options while the bars that extend from the loop bars allow you to do extra wide pull ups without any doorway interference. Solid Metal Framework - the unit is constructed of heavy gauge metal, giving you the confidence that it will take all the weight and stress that you care to put upon it. Extra Securing Clips - the extra clips allow you to secure the pull up bar in place if you choose to keep it permanently in position or just want that extra insurance to keep it all rock solid. Rubber Hand Grips - each gripping position has its own dedicated rubber grips to ensure hand integrity while performing your pull up motion. 300 pound maximum weight capacity - not only does this give you the assurance that the bar can handle your own body weight, but it gives you the leeway to add extra poundage to your body as you get stronger. The Iron Gym Pull Up Bar offers a wide range of pull up options that make it a great tool to thoroughly work the muscles of your back and arms. To get a bar that can match the extra width of the ProSource, however, you’ll need to invest in the Extreme bar, which will cost you an extra ten dollars. The unit is solidly constructed and provides for a rigid, stable platform for your hanging exercises. Ab straps are included to allow you to work your core without your hands slipping. The maximum poundage is 300 pounds and the mounting bar comes with an extra pin for rigid lock in. The Gold’s Gym bar features curved ends on the pull up bar to allow you hit your back from a unique angle. The durable construction and push / pull lock in design allows you to confidently work with weights up to 250 pounds. The parallel bar handles allow you to do a whole litany of pull up variations, including hammer pull ups. The bar features foam rubber pads at all doorway contact points to reduce the risk of scuffing or scratching of the door surrounds. This unit comes with the security of the Gold’s Gym name, offering a 10 year warranty. The Perfect Multi Gym Pull Up Bar is a solidly constructed, reliable and sturdy home pull up bar. It offers all of the hand grip options that you need, including neutral grip for hammer curls. The Pro version comes with a unique extra wide design to allow you to hit your lats from a super wide grip. All of the grips are covered with a hardy rubber grip to maintain the integrity of your grip. Dense foam pads where the bar meets the door frame will ensure that no marks or scratches are left on your door surrounds. The Perfect Multi Gym Pull Up Bar has a maximum weight rating of 300 pounds. 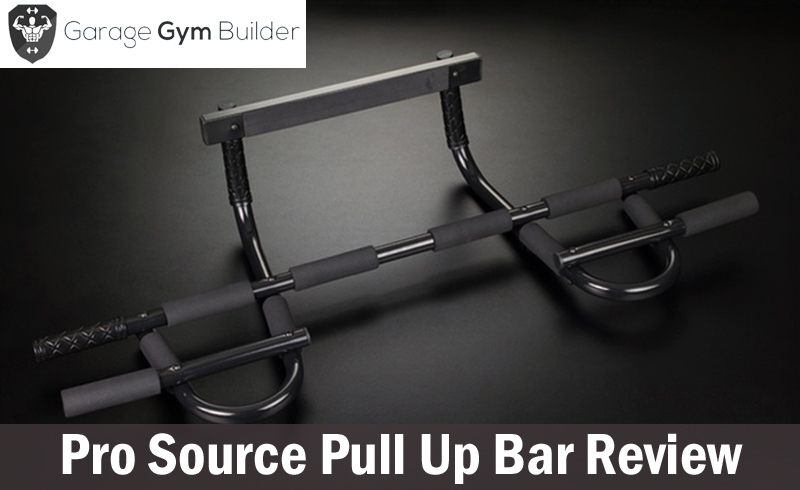 The Pro Source Pull Up Bar is an impressive entry into the doorway pull up bar market. It is a sturdy unit made from quality materials that offers a wide range of pull up options beyond what most bars provide. The inclusion of extra plates for mounting is another impressive innovation. The Pro Source Bar packs all of these features into a price point that makes it very competitive. The only negative is that it potentially leaves marks on your door surrounds. Place a bit of padding behind the contact points to overcome this problem. By the way, it is advisable to check out the Pull Up bar bands that help you perform the pull up movement better and this article for finding the best doorway pull up bars out there.